Disclaimer: This is not a pattern. I haven’t written down exactly how I made the Knit Kitty Mittens, and I sort of winged it most of the way. I don’t knit as much as I would like to. I can’t seem to find the time for bigger projects, so I am always on the lookout for easy and fun knit projects that keep me entertained, and that knit up fast. 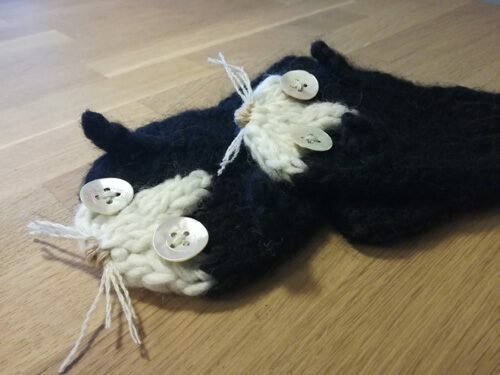 And so I made the Knit Kitty Mittens, for the daughter of a friend. I have the honour of being a proud PA to a beautiful cat. 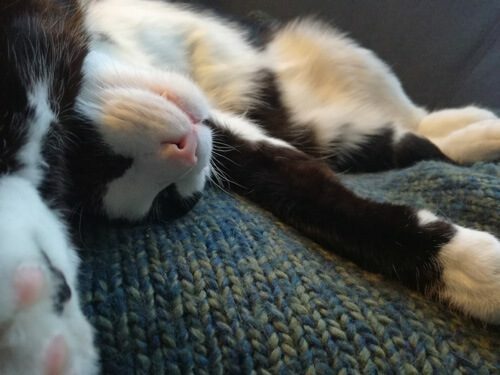 His name is Pongo, he’s a gorgeous tuxedo kitty, and thus always overdressed. He’s an indoor cat, though he’s allowed on the terrace when I am around to keep an eye on him. We live in an apartment on the third floor, and have put up a net to prevent him from falling. 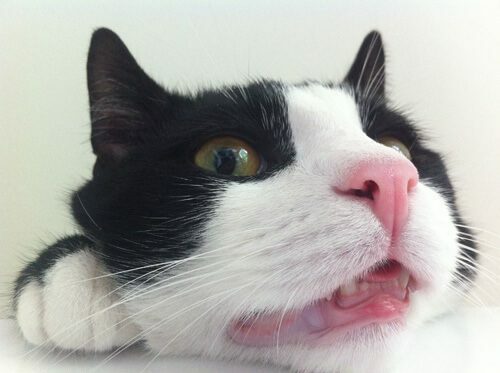 Not that he’s stupid, he’s just fearless, and very much a male – he won’t think twice before pouncing on something. When we´re travelling, I prefer to have a lady come look after Pongo. That way he gets to stay at home, with all his toys and stuff readily available. This lady has a 3-years old beautiful daughter; Ronja, who adores Pongo. And he adores her. 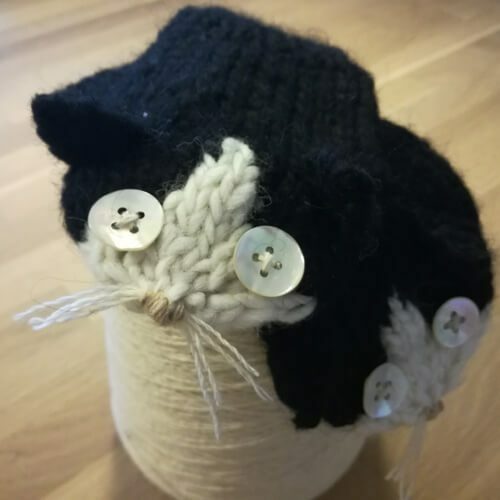 So to thank the sweet lady and her daughter for looking after him a weekend, I put together the Knit Kitty Mittens. I had a pretty good idea of how I wanted them to look like. They should look like Pongo, but I didn’t know exactly how to construct them to fit a 3 year old. I took inspiration from the construction of Purl Soho’s Classic Mittens, as they seemed easy to knit, and then winged it from there. I particularly loved the simple construction of the thumb. I made the Knit Kitty Mittens in two colours of a supersoft alpaca blend I had in my stash. I bought the yarn online at Garnudsalg.dk – this is where I buy most of my yarn (the shop is in Danish only). 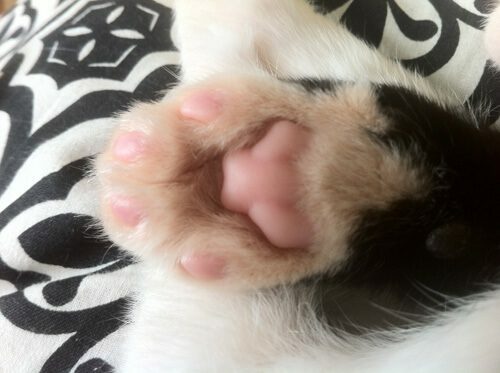 I toyed briefly with the idea of stitching little pink paw smushies on the palm of the mittens, but gave it up, as I didn’t want the mittens to become too “busy”. I knit the mittens in the round, one after the other and then picked up stitches to knit small triangular ears afterward. 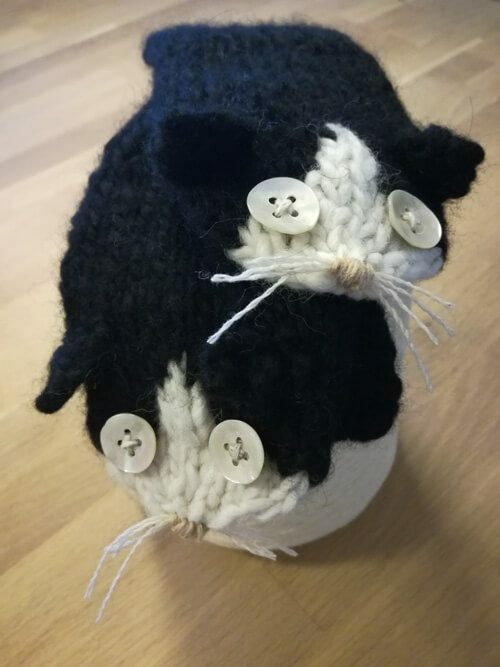 Then I stitched a little nose, attached a few lengths of scrap yarn for whiskers, sowed on a couple of buttons for eyes, and the Knit Kitty Mittens were complete. The mittens knit up fast on big double pointed needles, I think it took me 5-6 hours all in all. I am quite satisfied with the final result and Ronja absolutely loved them. She got them just in time for the first snow too.